This is download Best Android ADB Driver. The ADB tool I share now this post is also called 15 Seconds ADB Installer. With this tool you can install the newest version of Android USB Driver on your Windows OS based computer in a matter of 15 seconds. And it is a free software guys. On this post you will find all the available versions for you to download. And remember many things can be achieved using this ADB driver such as repairing your MTK IMEI, flashing TWRP recovery and also rooting. This software is only about 9MB only. Doesn't eat your computer's storage too much. However it is so powerful and supports many giant and small device manufactures. Installing the 15 Seconds ADB Installer is very simple. Just download the driver to your computer then extract the file. Then launch it to follow the on-screen instructions to install it. It's so easy everyone can do it guys. Everything is provided, you will find ADB, Fasboot and newest Android drivers from this software. The Fasboot files within it are based on the newest version of Android SDK package and it's supporting to Android 6.0 and newer version. 15 Second ADB Installer supports Windows XP, Windows Vista, Windows 7, Windows 8, Windwos 8.1 and Windows 10 running on either 32 bit or 64 bit system. 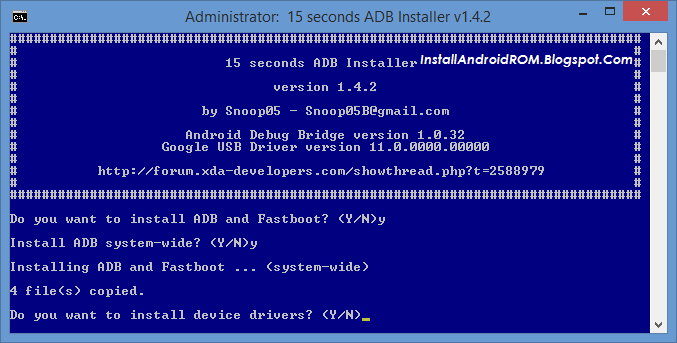 15 Second ADB Installer is a free software created, developed, maintained, optimized and released by Snoop05 an XDA developer. You should thank him for making this very wonderful software for us to use. If you face 0 Files Copied Error then try to use the version 1.3.0. Via how to install ADB and Fasboot on computer easily.